I wish someone had told me about their experience with wet AMD when I was diagnosed. Having no guidance can be scary. This is my personal story with dry, then wet AMD in both eyes, and begins with who I am and what I do. I’m a photographer and portrait artist; I need my eyes. Imagine clientele coming to me if they think I can’t see! That hasn’t happened, because of a great optometrist and terrific retina specialist. Part of my story is a recurring nightmare I had. I was in a gray room and it was locked. I was alone, and someone had taken my crayons. I woke up in a cold sweat, terrified. I don’t paint with crayons, but my world is filled with color—color that was gone in my nightmare. Hi. I was recently diagnosed with wet AMD, having dry in both eyes. I'm 75. I do not have a partner to help with things like driving at night and live out in the country. I will be putting my name on waiting lists for independent living facilities close to or in town. One is in easy walking distance to lots of stores and the library. I currently have a 2000 sq ft house and three acres snd some arthritis so it will be a relief not to have all that property to take care of. I am a nature photographer (amateur), frequently using a macro lens. I think down the road I'll need to get a larger computer screen. Thank you for your hopeful story. I can relate to your comments even though I only have dry macular degeneration in both eyes. I also love color. I've noticed that when I close one eye a white wall has a blueish tinge. When I close the other it has a yellowish tinge. I don't know if this is even related to my macular degeneration, but it scares me. I also get a little clutch in my heart when I notice that a CD isn't perfectly round. I have enjoyed my vision more in my 58 years than most people do in 100. Helen,fantastic story of your journey with your eyes. You prove that self help, combined with the right professionals,is all-empowering. I just found this website today. Thank you for providing such great information. 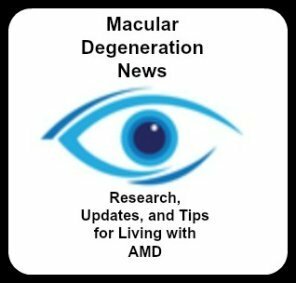 I was diagnosed with Dry AMD in both eyes in my late 40's. I lead a healthy life of exercise and eat whole foods, including abundant fruits and vegetables. After my diagnoses, I began the specific AREDS formula vitamin regiment. I do have a history of AMD in my family. Despite my efforts and regular eye exams (every 6 months) alternating with my general ophthamologist and my retina specialist, I just learned that my right eye had progressed to Wet AMD. I am now 55 years old and received my first injection of Avastin about 8 weeks ago in my right eye. I just saw my retina specialist for a follow up visit and my eye is responding to the treatment and "plugging the leak". I was so happy. I am on a 6-week follow up plan. Although there is no guarantee that I will not have another "leaking spot", I am pleased to know that the treatments work. Over the years it has been a slow and sometimes annoying adjustment....need of more light, use of magnifying lenses, restricted activities, etc. I no longer feel safe to drive at night and have to rely on others to help me.....which was a huge adjustment and loss of independence. I have found that people love to help...I just have to ask. After two years of eye injections at monthly intervals, my (MD) leakage has become non-responsive. I have been getting injections at two week intervals for two months. My dr has suggested that we might consider Visudyne Therapy which is a cold laser procedure. I would like to hear from anyone who has had this procedure. I have had a dry spot in my left eye for several years, without knowing it. It started (probably 5 years ago) while I was driving in the Kruger National Park (South Africa). I was driving out of Olifantskamp up a hill in the late afternoon (+-16h00). As I turned around a corner to the other side of a hill, I was suddenly blinded when the sun (setting on the horizon, but still fairly bright) shone right into my eyes. I needed to shield my eyes, but I still needed to see something while coming to a stop. I am still not 100% sure if it was related to the accident but I have always assumed so. A couple of months ago, the dry AMD spot returned into a wet AMD blob. I am now treated by the Avastin injections and am actually curious if the end result is going to be better than the dry blind spot that I had before. It seems now to be much wider, but not so intense as before. Thank you Rene for sharing your story with us. My family visited Kruger National Park many years ago. What a thrill to see elephants, giraffes, lions, and rhinos. Hope I can go back some day.